Documentation is important but it is critical to realise that it is not, in itself, the quality system. Because the major obstacle that you see when you decide to adopt a formal quality system is the production of the documentation, it is easy to fall into this trap. The key piece of quality documentation is the quality manual, describing its policies, the structure of Quality system documentation and compliance to ISO/IEC 17025:2017 & relevant accreditation specific criteria. . The quality manual is, typically, prepared and checked by laboratory management, usually under the overall co-ordination of the quality manager. It should, however, be formally authorised for issuing from as high a point in the management hierarchy as possible; chief executive, director general, chairman are typical points. This ensures that the manual has the strongest authority and also shows, to the accreditation body, a commitment on the part of the senior management to the quality system. A policy documents the laboratory’s intent to implement ISO/IEC 17025. The Quality Manual is the top tier of the document hierarchy. It describes the approaches to achieve quality data. It also includes policy statements describing the laboratory’s intention to conform to ISO/IEC 17025 requirements. For example, a policy statement could be: All personnel involved in calibration and testing should be competent for the assigned task. A process or generic procedure describes how various quality requirements can be achieved. For example, it describes how the requirement ‘Personnel should be competent for the assigned task’ can be implemented. Standard operating procedures (SOPs) or Working Procedures are step-by-step instructions for how to exactly perform a specific task, such as calibrating a specific instrument. Records are generated on a day-by-day basis, such as analytical results from product tests or calibration records of a balance. All documents should be properly controlled. For example, each change should be authorized and logged, and the updated document should get a new revision number or code. 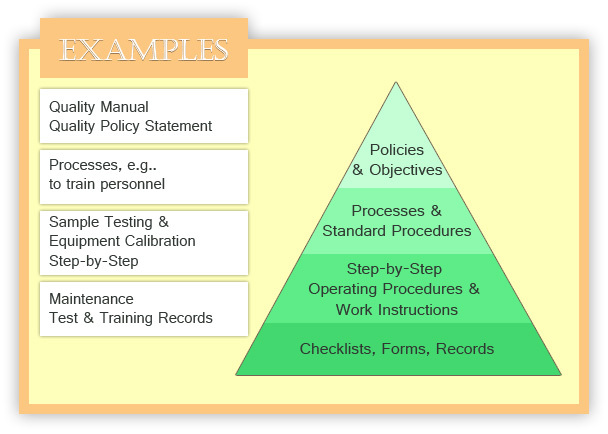 Policies including the quality policy statement should be documented in the Quality Manual. Senior management should write the quality policy statement, which should outline the laboratory’s commitment to quality. The quality manual describes the quality system and documents the laboratory’s goal and overall concept for how to conform to ISO/IEC 17025. It should also describe how the remainder of the quality system documentation is organized. It should be developed by working groups representing different departments. Processes or standard procedures describe how various ISO/IEC 17025 requirements can be achieved. For example, it describes how the requirement ‘All personnel involved in calibration and testing should be competent for the assigned task’ can be implemented. Another example is the laboratory’s approach to calibrating and checking different types of equipment. For a better understanding, process flowcharts should be included in a process description. Routine activities follow documented procedures. These are typically defined as standard operating procedures (SOPs) or work instructions. While quality manuals and processes describe tasks and approaches, procedures and work instructions give step-by-step instructions on performing tasks. Examples of SOPs are procedures for checking and calibration of equipment. All laboratory SOPs should use the same format, to make writing and reading easier. A good practice is to have an SOP for how to author, review, approve, distribute, and update SOPs. Preferably senior members of anticipated user groups should write SOPs. This helps ensure that SOPs have the right level of information and are used and followed. Records to demonstrate conformity with ISO/IEC 17025 and as required by customers should be retained for a specific amount of time. Examples are original laboratory observations, test results, supporting documents such as chromatograms, and training certificates and equipment calibration protocols. Checklists, forms, templates, and examples help implement quality work effectively and consistently. Examples of these include checklists and worksheets for vendor assessment, handling nonconforming test results, and for internal audits. These items help document specific tasks consistently and effectively. Development and maintenance of documentation should be controlled through document control and management procedures that are part of the management system. Documents include both internal, such as SOPs, quality manuals, and training plans and external documents, such as regulations, standards, test methods, and instrument operating manuals. Official documents are created or acquired, reviewed, and approved prior to use. Documents are uniquely identified with document and revision number, date of revision, and issuing authority. A quality list with all controlled documents is maintained by QA. The list includes document and revision number, title, date of issue, date of last review, and locations. Internal documents include page numbers and total number of pages on each page. Users of the documents are adequately trained before the documents are released.